Illuminating ten key aspects from the Old Testament, this concise book provides engaging insights into the Bible that are worth knowing. Written by Phil Greenslade, a renowned and popular Bible teacher with over 40 years of biblical teaching experience.This book looks to answer the `how?' and `why?' questions we may have about the Bible to help us appreciate how and why it is God's Word for us today. 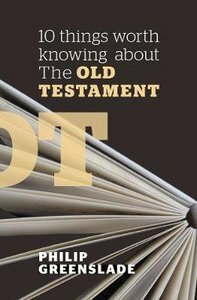 About "10 Things Worth Knowing About the Old Testament"
.Philip Greenslade has been a full time lecturer and tutor with Crusade for World Revival (CWR) since 1991and is the general editor of the Cover to Cover Bible study notes. He is also the Consultant Editor of Bread for the Journey pastor's journal, and, was with Selwyn Hughes, a teacher of the Institute of Christian Ministry. He has authored a number of commentaries on Psalms, 1 Peter, Philippians and 1 & 2 Thessalonians, and his latest book is Worship in the Best of Both Worlds.